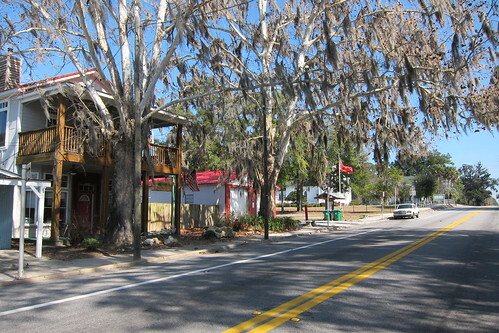 As we were leaving Lake Butler the sunshine that had decided to poke through during the lunch hour seemed to be retreating. Clouds were rolling in and we still wanted to get another 10-12 miles in before stopping for the end of the day. 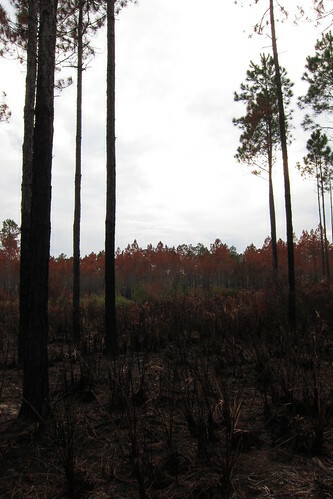 We left town following a road west and then north before entering the Lake Butler Forest, a pine plantation owned by Plum Creek Timber. 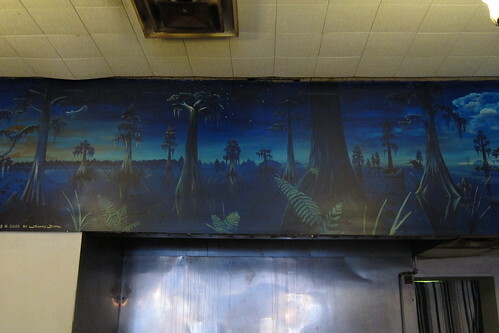 It’s a forest but it’s a crappy one. Back when we’d first met Shamrock Steve down near Titusville he’d told us of an area with these weird mounded hills that were a pain to walk across. Then it was some foreign location way away from us that it would be a long time to get to. Well, we were there now. Initially through the LBF it was along some forest roads. With the recent rains there were puddles in the road and you could see water between the mounds where the pine rows are planted. 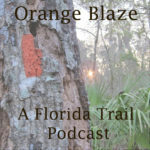 We didn’t think anything of it until we’d find a clear cut area that went through the pine plantation but the only demarcation of a trail was the tiny strip of trees that were left in the clear cut because they were blazed orange. The first time we saw this we ignored going on the real trail because it paralleled a forest road. It was stupid really to take the trail through the woods there instead of staying on the road. But then we saw we really needed to get off the road and onto the trail further down despite our strong lack of desire to follow the trail through the clear cut. The clear cut was awful, small trees and branches strewn everywhere, blackberry brambles covering the ground and then the water puddles between the mounds. It wasn’t a trail, it was despicable. We tried to follow the road around as far as we could go but then it was inevitable we had to get into the nasty clear cut. It was then we thought we might not make 12 miles that afternoon if we’d have to slow down like that. The trail eventually got back into the pine plantation that wasn’t cut down and the trail was a little better and kept winding around between roads, clear cuts and planted pine. It was not a pleasant section of trail. In fact, I’d just suggest road walking instead and that says a lot because we came to hate road walking the further north we got on the FT. 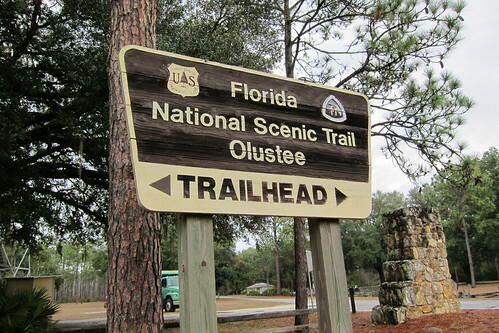 The Lake Buter Forest is really a pitiful example of trail in Florida. We came to a small creek which we had to walk up to the road and back around to by pass it, and we wondered why a small footbridge hadn’t been built over this creek yet. On the other side we met a hunter who’d driven in to pick up a trap; he’d caught a raccoon. It was in the smelly stage of death. At that juncture there was a white sign posted that we could bypass the actual trail by following two forest roads in an effort to avoid the clear cut the actual trail went through. Of course we were going to do this! At this point we really wondered why the maintainers even bothered having it go through the forest at all knowing that it would just be cut down eventually. Despite the book saying we had to camp in designated spots in this area (I really wonder at the FTA sometimes, do they not understand thru-hikers? We’re going to camp where our miles take us! If you don’t have enough designated sites or places to camp, too bad! We’re not doing short or extremely long days just to fit into some campsite location.) we pitched our tent at a good location in a nice planted pine area where Speaker could hang a hammock and we could pitch our tent. It was possible someone might drive around out there, but highly unlikely. We did pass many hunt stands with deer feeders out so I know hunters came sometimes. And we always shook our heads at the ‘sport’ in baiting a deer like that. That’s not hunting, that’s waiting and baiting and killing something too easily. The next morning the sky finally cleared up for us and we had one mostly sunny day to walk in. We left Speaker since he was planning to get off at the Olustee Battlefield at the Osceola National Park and hang out with the Chuck Norris crew for the Super Bowl. We’d been planning to get to White Springs to take our first zero day or a close nearo so we decided to keep going. Through the rest of LBF it was pretty much miserable walking. We were able to follow some more forest roads and at one point managed to miss the actual trail and followed a white blazed road instead. I looked over and saw the tell-tale sign of the FT through the clear cut, a sliver of tall trees in the middle of nothing. Eventually we got back in the woods but ended up following the little ditches between the rows as the actual trail, except that with all the recent rain they were flooded. We tried our best to finagle our way around it, walking through poky palmettos and the edges of the water, but it was slowing us down. Gah, I hated the LBF! Eventually we came to another sign that said we could bypass the actual trail and follow a dirt road and we chose to take it. Later we found out that Love it or Leave it decided to follow the actual trail and severely regretted it. He’s someone who takes blue blazes or sometimes an easier way so I was surprised to see hear he took the actual trail. Finally after two rough days we made it to Osceola National Forest! 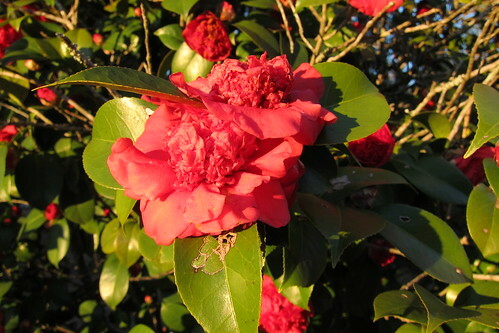 Since the day was sunny the pine needles were warmed and their aroma wafted through the forest. For the most part the walk through ONF was beautiful, particularly the area south of I-10. We wound through beautiful trails and it was fairly well maintained. There were nice bog bridges over some small creeks and sloughs. We had lunch just past Ocean Pond campground on a boardwalk through a cypress dome, eating some of our dehydrated refried beans for lunch and trying to dry out our shoes from our morning walk through the wet LBF. We crossed I-10 for the first time. We’d cross it three more times in the coming weeks. On the north side of ONF we encountered a burn area as well as some clear cutting. *oh great* we thought. More crap to walk through. It wasn’t terribly bad and at least there wasn’t too much water pooled up, it seemed their rows were lower and better built than LBFs’. We came to our third shelter on the trail, it was really an all side open pavilion but it had a privy, too. 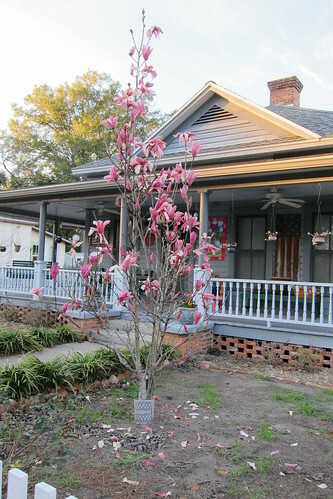 We flipped through the log book and saw that Li’l Buddha had stayed there last year for a zero when heavy rain was forecasted. On our merry way north we met a young guy and his dog who were traveling cross country in his car and camping at various forests and campgrounds along the way. He was heading out on the trail a mile or so to pitch a tent for the night. When we told him what we were doing he was excited and gave us props for doing what we were doing. The trail started getting a little less maintained in this area with bog boards and bridges across low areas on the forest roads in need of serious repair but also to clear the blackberry vines from the area. There were countless times when they latched onto my skin and clothes, and expletives left my mouth many times. Argh! I was not a happy hiker! It seemed a slow day but I think we’d put in 23 miles or so, more than we’d initially planned in order to get closer to White Springs since we knew it was going to be a 70% chance of rain the following day. 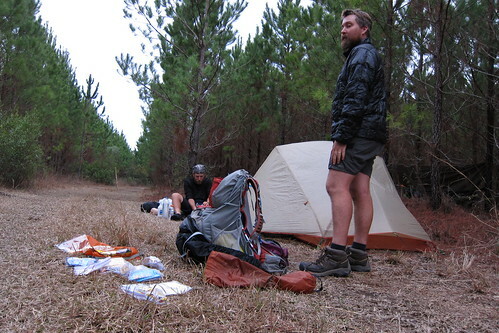 When we arrived at the west fire tower primitive campsite it was getting late in the day. We saw a nice campsite closer to the trail but kept following the side trail to the main campsite because we knew there was a water tap and a bathroom. 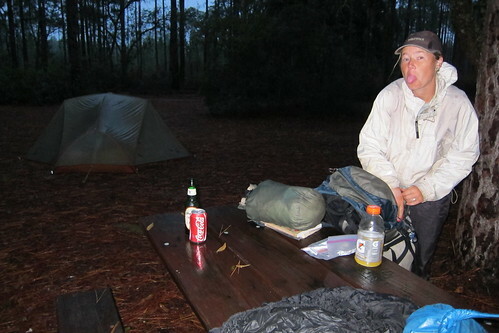 When we got to the main camping area there were several long-term people camping in trucks and campers that we decided to fill up our water and head back to the quieter campsite under the oaks. We’d been there for a few minutes when another truck comes back to the campsite. A woman got out and started talking to us and asked if we minded that she camp on the site as well. The place was big enough for many people and we knew she’d be quiet and not cause any problems with noise. She joined us as the picnic table for dinner where we found out her trail name was Hammer. She’d done some volunteer work with the FTA before and liked doing small sections on the FT. Apparently she’d had a rough week at work and was letting out steam by hiking in the ONF. Hammer gave us some trail magic drinks before we dashed inside the tent when some initial pre-storm rain started coming down. The next morning was not pretty. It was raining and I had a stomachache. Not a good combination. No one wants to need to dig a hole when it’s raining. We packed up and got on the trail as fast as possible because we had at least 22 miles or so to get into White Springs. It would be a long day because of the rain. The first two hours or seven miles seemed to go alright. The rain from the early morning had stopped and though we had our rain gear on we’d been able to unzip everything and keep our hoods off. We walked through recently burned areas, probably as recent as the day before since the areas were still smoldering. We made out the trail as best we could since most blazes were gone. Almost through with ONF and the rain started coming down heavier; we put our hoods on and zipped everything up. At the entrance on the west side of the park we found a trail closed sign—would’ve been nice to see that on the other side! The FT then followed a road west where blazing was minimal and poor. We arrived at the junction of 441 and were a loss to where we went. No double blazes or blazing in sight. And it was pouring rain. Chris pulled out the map, something we should not have had to of done if the area was blazed properly, and tried to keep it as dry as possible. We were now on a long road walk down dirt back roads. A few miles later we had to pull out the map again because of poor blazing to figure out where to turn. I was very angry with the maintenance at this point. The rain showed no signs of letting up. By this point the rain gear was starting to become ineffective and we could feel our clothes getting wet from sweat but from the rain as well. And it was chilly. We just kept walking down the roads, forgoing our morning snack in favor of trying to make it to the Madison shelter for lunch. On the map we could see a line for future trail that would’ve bypassed the Madison shelter. Initially we thought if it was open we’d take it but then because of the rain we really wanted to go to the shelter so we could eat lunch instead of trying to down something in 10 minutes under a tree. Thankfully, I suppose, the new trail was not open (it would bypass the roadwalks and head straight for the Suwanee River) and we were able to get to the Madison shelter for lunch. 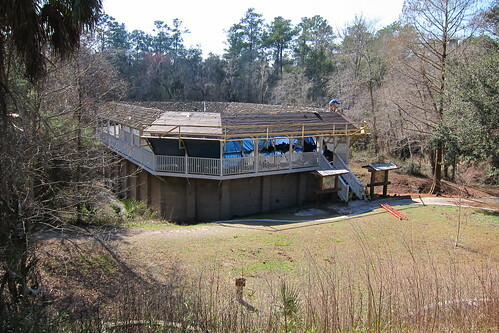 I was so thankful for that shelter, a shelter on private land put up by the Madison family. We stripped down and put on dry clothes and if we hadn’t been close to White Springs we would’ve bunkered down there for the rest of the day as it had a wood burning stove and would’ve kept us dry the rest of the day. Instead we made a hot meal to get the chill off and replanned our day. 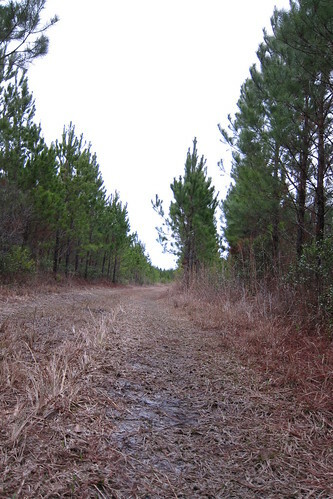 The trail follows a road again after leaving the Madison property before ditching back into the woods and coming out near some shoals on the Suwanee River. On the map there was a white blazed road walk into White Springs which would cut off at least five or six miles to our day and get us into town much earlier than we’d planned. We also took into consideration that there might be swollen creeks and the river might be up with the rain. With our rain gear back on we settled in for a road walk instead of the actual trail in an effort to get to town early to warm up. 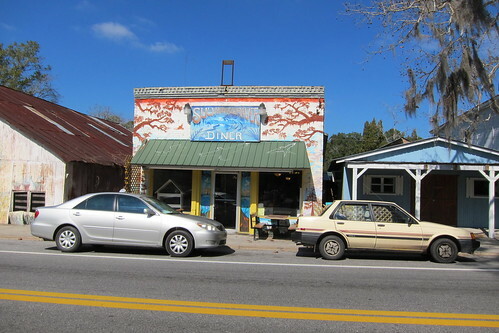 Once on U.S. 41 we crossed the Suwanee River and saw where the trail went and though we were a little sad to have missed some beautiful hiking we were happy to be close to White Springs. In town we scouted out where to eat and visit later on. The guidebook boasts this as a great place for a zero but having been written several years earlier it seemed now the town was slowly becoming run down. The main grocery store had closed and we were glad we’d done a maildrop here. On the way in we passed the post office and decided to get our drop there first since it was the only post office that’d been strict about holding our package for a particular length of time. Inside we found Love it or Leave it shipping a box ahead to another town. We chatted with him for awhile and caught up with what he’d been doing. 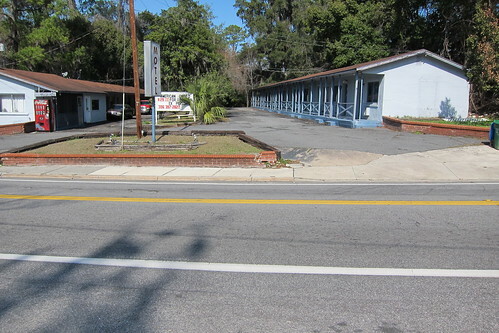 He told us that the motel was a little run down but we brushed it off as nothing new from where we’d stayed on the AT. He was staying at a B&B we’d passed on the way in and had gotten a killer hiker rate of like $25 a night. After getting our package we found the motel. It was a dump and it appeared to be more of a place people lived at than stayed for a night or two. The main office was closed but a resident came out and told us we could find the manager in the laundry. He came out and we told him what we needed. At first he thought for a few minutes before he decided he could put us somewhere. He had to clean the room first and had to run to the dollar store to buy us a rug and towels for the room!!! We sat under the overhang of the motel on a bench for over an hour before we were able to get into the room and shower. The closest thing I could come up with was that this was the FT’s Doyle Hotel. And since we were hiking we’d just roll with it and not worry about it. The hotel room became a giant dry-out room as we unpacked the tent and our gear all over the room to dry out. Even our sleeping bags had gotten water on them. Our pack cover had kept some things dry but when it rained enough a puddle of water would always pool in the bottom of the pack cover. We chose to relax and watch tv and head down to the laundromat to do laundry and eat at the only restaurant in town, a bbq joint. The next day was pretty lazy with sleeping in and moving watching on the agenda. 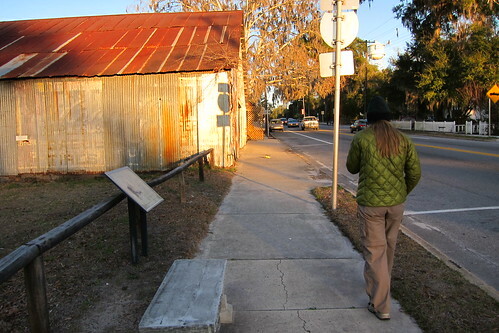 The town was small and quiet with not a lot to see but we walked up and down U.S. 41 many times. At this point I really need some new socks. I’d only bought one new pair for the hike and didn’t realize that my other pair from the AT was thinner than I thought. 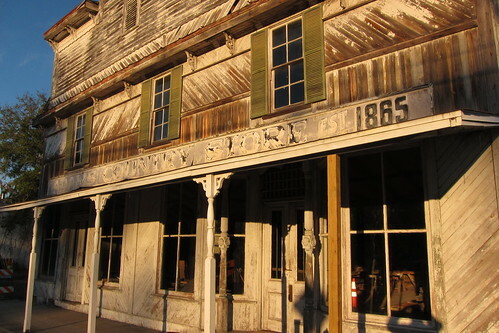 We had hoped to hit the outfitter in town but found out this was the old location and it had moved several miles out of town, not within walking distance. I guess I’d have to stick with holey socks. 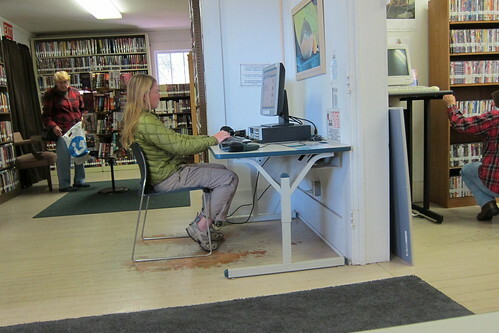 We hit up the library in the afternoon for some internet time. Saw the currently being renovated spring house in town. 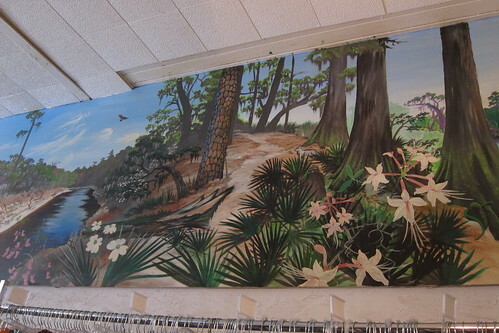 We went in the old Suwannee Diner, what was now a going-out-of-business resale shop. 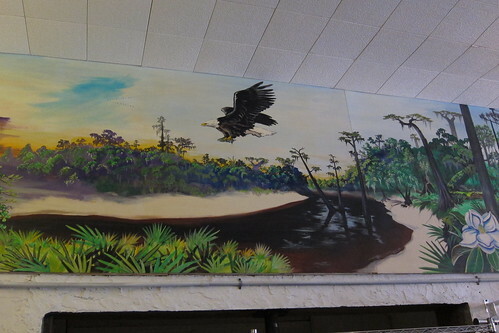 We went in to see an old mural of the Suwanee from source (Okeefenokee Swamp in GA) to sea. 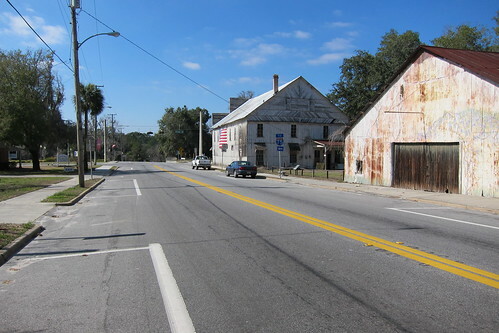 It is really a shame that these old Florida towns are going so much downhill. It would be a great hub for kayaking and hiking if they could built it up some. 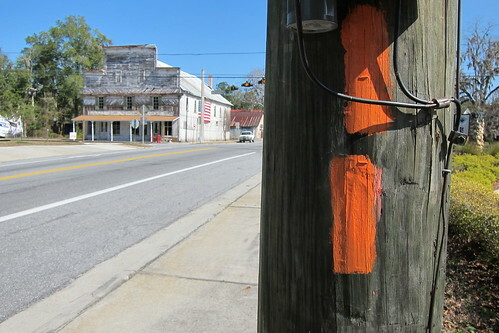 It doesn’t help when the outfitter isn’t located in town any longer. 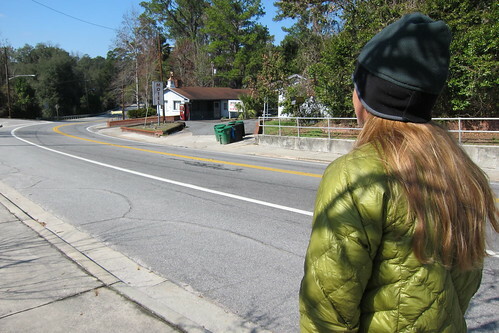 We wrapped up our zero in White Springs and headed out the following morning for several days of hiking along the Suwanee.